We are a creative bunch over here, and we’d love to share what we are doing as we do it! This is where you will find a few of the things we are making in the Ferg home. So things have been a little crazy around here lately. This would be the reason why I haven't set "foot" on wordpress in what feels like weeks. You see, our sweet little nugget turned one on Saturday. So naturally I went above and beyond to see my ideas come to fruition in celebration of this boy. With T being deployed I knew that it needed to be special. More so for me, not really for M... while obviously it was his birthday, this Mama needed something to work towards to keep her mind off of the big, sad reality. Daddy was going to miss this milestone. BUT, thankfully, we have so many more birthdays and first for him to be here for, so we made the most of it and look forward to the future with lots of hope and joy. Quite awhile ago I had decided that M's birthday just had to be camping themed. We not-so-secretly want our kids to grow up to be nature loving crunchy people who appreciate the beauty that surrounds them. So naturally we are thrilled that our kid loves to be outside more than anywhere else. I took that and ran with it. 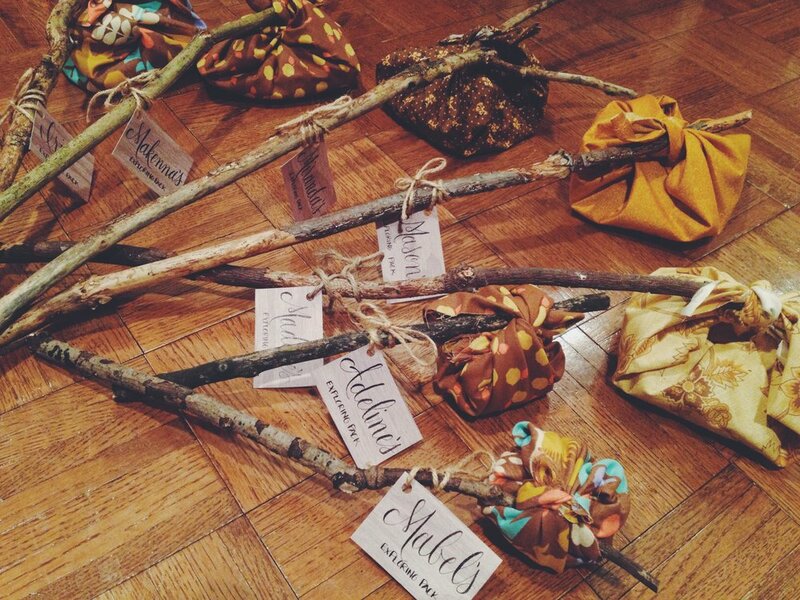 My very first idea was little exploring sacks. Because I'm not the biggest fan of the word "sacks" (laugh if you must, but I really can't stand it... that and "jiggle"... ugh...) I decided to coin them "Exploring packs". I just had to see them become a reality and I'm so glad they worked out. The kids absolutely loved them and spent the end of the party asking, and then asking again how to tie up their goodies so they could go explore. My other big job was displaying his monthly photos. If you know me you can understand how I couldn't just settle with hanging a few prints or displaying them in frames. No, that would've been the sane thing to do. For whatever reason I like to give myself insane amounts of work, causing me to stay up until all hours of the night. So having said that, I introduce you to my wood transfer photos. This is the second time I've done this method and I do believe after 12 transfers I figured out the trick to get a good print. The neat thing is I can keep these for a long time and use them around the house (if T will let me). *Word of caution: maybe don't do so many at one time... unless you have someone else's willing fingers to help you rub. You can find the moderately helpful tutorial here. Please, please, please be sure to sand your wood very well before beginning. The smoother the wood the better the photo will turn out. To save money while trying to stay away from plastic table cloths we took a trip to Ikea (where we also scored those awesome lanterns!) and found this amazing wood print fabric. It's truly amazing. Truly. I am pretty in love with it and can't wait to have our home back so I can see it every day on my own table. We also went to Hancock Fabrics to purchase burlap by the yard and I just sewed the edges to keep from fraying. Much cheaper than buying pre-measured burlap tablecloths. I also took a gander on Amazon and found some awesome treasures. From brown paper trays to serve cake on to twine and red and white checkered tray liners, Amazon definitely served in making my hunt easier. One of the best things from there ended up being something I just stumbled upon and couldn't let pass by. Old school Cracker Jack. Everyone loved them! Thanks to Pinterest I was given the grand idea of a Trail Mix bar... but really, how I didn't think of it myself I'm not sure. What goes better with camping than trail mix?? I ordered the little bags (along with striped straws, cupcake wrappers and wood forks from The TomKat Studio). Thankfully Grandma P has a lot of stuff at her house to pick through, and these canisters worked great paired with extra Ball jars. I knew I wanted chocolate cake. I also knew I needed to try to incorporate s'mores without being obnoxious and overly marshmallow-y. So I opted for a family chocolate cake recipe with an ah-mazing Marshmallow Frosting recipe. The cake would be frosted very simply because I really liked the idea I found at this camping party. Sometimes simplicity is key. But obviously I was going to need to crush and sprinkle some graham crackers... and here is where I reached my perfect s'more cake balance. Sprinkled graham cracker crumbs in the middle frosting layer serving as a pleasant little surprise... Mmmm. 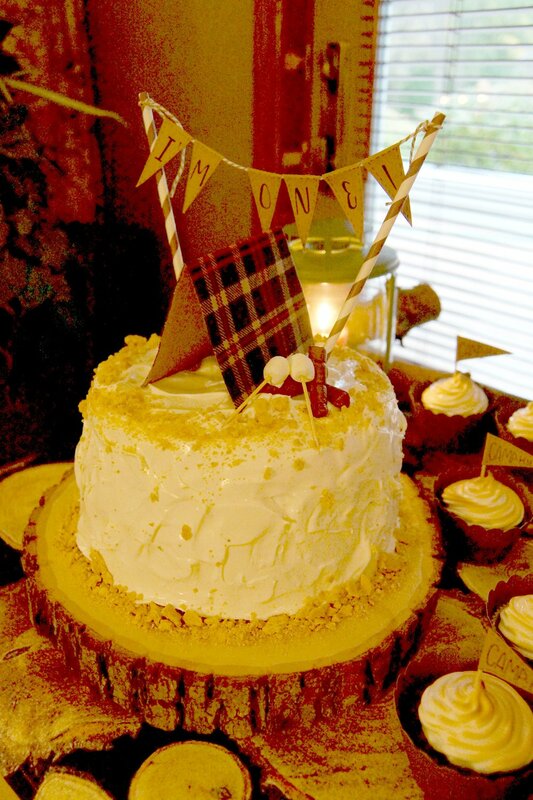 I don't want to toot my own horn but really, I still dream about my experience of eating this cake. For cupcakes I made a graham cracker crust and pressed it in the bottoms of the cups to bake for 10 minutes before adding the batter. Once iced I popped them in the broiler for a minute to lightly toast the tops. Then added my little brown paper flags and voila! My dear friend, in all her awesomeness, wanted so badly to help with the party... but she lives allllll the way in Texas. So what did she do? She made the awesome banners for the party and shipped them up just in time. They are perfect in every way and will be used countless times. I should probably save the extra fabric so she can make names for our future kids to match the "Happy Birthday". I didn't hesitate to peruse the house and backyard to find little decor additions. 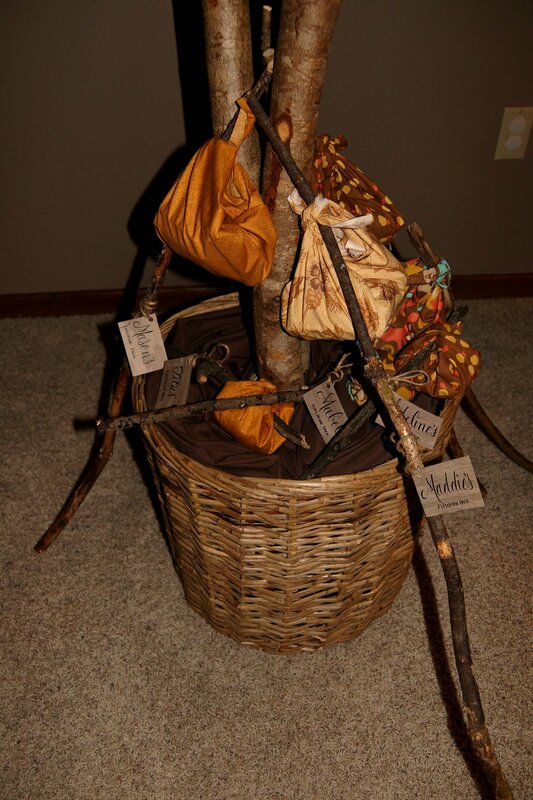 From my mom's lawn ornamental Fawn, to logs from my dad's woodpile, it definitely added to the charm of the party. M's toy black bear helped out a lot too. The birch candles are another Ikea score. They are amazingly wonderful. Seriously, go hit up Ikea. You will be glad you did. We had to have twinkle lights. 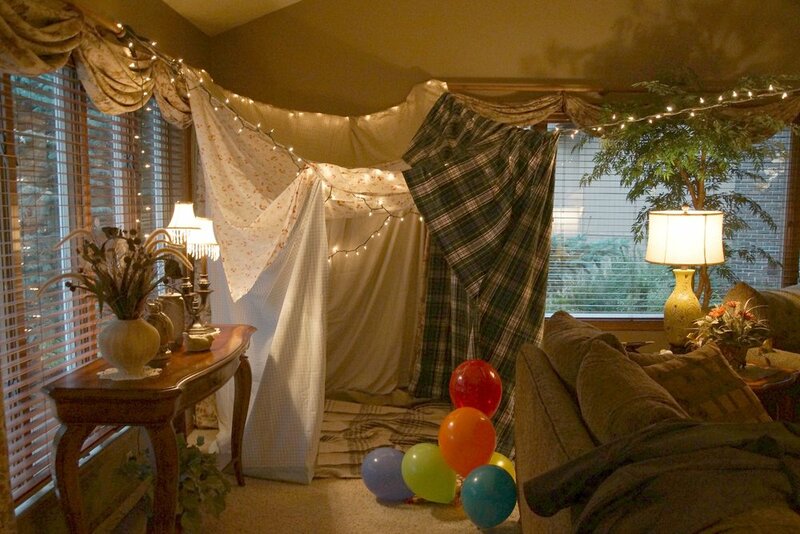 If we couldn't camp out under the stars then we sure had to bring the stars indoors. 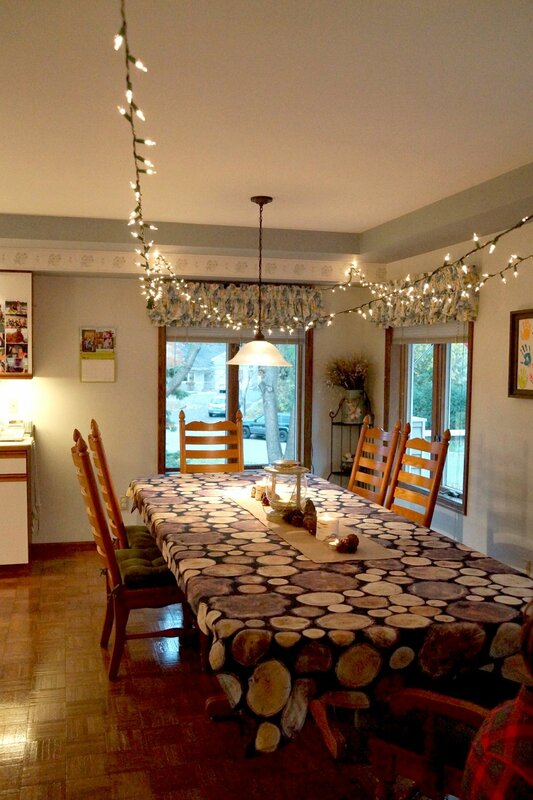 It's amazing how a few strings of white lights can add so much ambiance to a room. I was very sad to take them down. One thing I will highly recommend to anyone with kiddos and the means, is to create a photobook for each year. I made one for M and left it out for family and friends to jot down their favorite memory of him in his first year. They can be a bit spendy but if you plan for it and utilize their many discounts it's definitely doable. 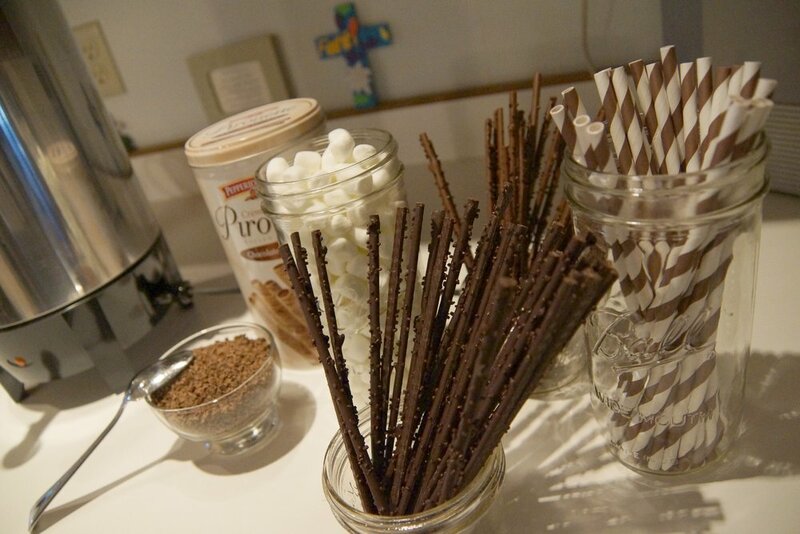 And lastly, a hot chocolate station. Obviously this is a must. But don't go with the powdered stuff... these types of occasions call for the super-bad-for-you-but-oh-so-good real stuff. I used this recipe and it was one of the better decisions of the event. You can choose whatever fixins you like, but we opted for whipped cream (obviously), mini marshmallows, chocolate shavings, pirouettes and milk chocolate and mint chocolate twigs (found at World Market). Oh it was so good. 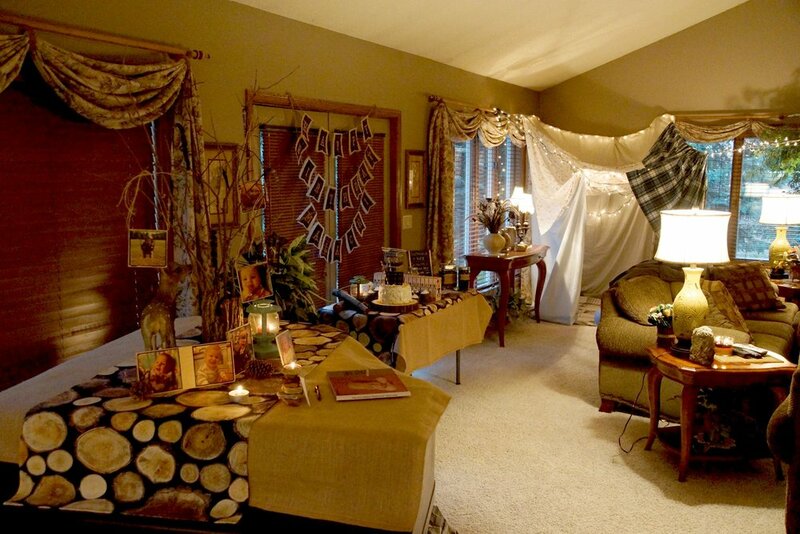 Be sure to complete the theme by asking your guests to wear camping attire. It's just really fun seeing so many people in one location wearing flannel. Plus, who doesn't love a lumberjack baby? "Hobo Meals" - The foil wrapped dinners cooked over the fire (but in reality there is no time to cook them over the fire so you bake them in the oven). Dutch oven bread - So good! Crock Pot Beans - family recipe... couldn't share it even if I wanted to because my mom made them. Cans of pop - In a cooler, because that's what you do when you camp. All in all it was truly a dream come true. It meant so much to me to be able to see this dream become a reality. As I said earlier, it was a pretty emotional night. It's not mine or T's first choice for me to hold up the parent front at these events but I'm unbelievably thankful for the family we had here to support and encourage. 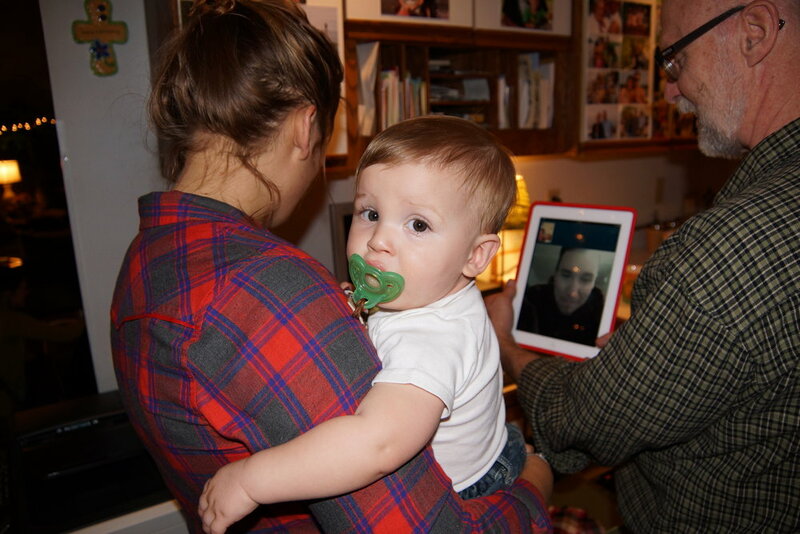 And I'm also really thankful for Skype... Daddy didn't have to miss much. I think I could be a party planner. Lord knows I would enjoy the crap out of planning parties on someone else's dime. So if you know of someone who needs some party inspiration send them my way! I won't have another party to plan for a year.